Volkswagen India has launched the Passat luxury sedan in India. The car’s prices start from Rs. 29.99 lakhs, ex-showroom Delhi. The Passat is available in two variants – Comfortline and Highline. The Highline variant is priced at 32.99 lakhs. The car competes with the Honda Accord Hybrid (43.53 lakhs), Skoda Superb (24.32 lakhs) and Toyota Camry (29.63 lakhs). It is meant to give buyers the luxury of high-end luxury cars like the Audi A6 and BMW 5-Series but at less than 60 % of the price. Volkswagen wants to sell the Passat to those buyers who want an understated luxury car. A lot of such buyers exist in India who want to keep a lot profile. For such buyers, the new Passat is perfect. It is both modern and luxurious yet subtle and relatively inexpensive compared to the German luxury trio of Audi, BMW and Mercedes Benz. Both variants of the Passat will be offered with a single engine – the 2 liter TDI turbocharged diesel. This engine produces a maximum power of 177 Bhp and a maximum torque of 350 Nm. The gearbox is a dual clutch automatic with 6 speeds. The car is rear wheel driven. Though the new Passat is 2 mm shorter than the 7th generation model, it offers more space. This is due to the wheelbase getting longer by almost 80 mm. Width also has increased by 12 mm and the car sits 14 mm lower in height. Boot space has also increased to 586 liters, from the older model’s 560 liters. 12.3-inch TFT digital instrument console shared with the Audi TT, touchscreen infotainment system with Apple CarPlay and Android Auto, a new Park Assist and a Head Up Display (HUD) unit. The new Passat is the 8th generation model, and is assembled in India. 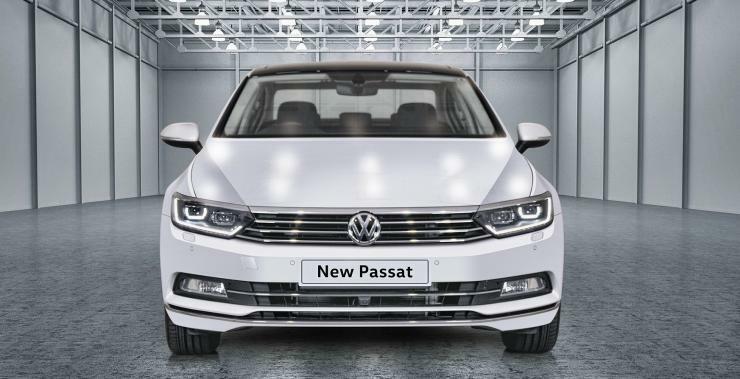 It is the first Passat to be based on the Volkswagen group’s MQB platform. The Passat shares this platform with the Skoda Superb. This is the reason why Skoda’s Aurangabad plant manufactures this car from completely knocked down (CKD) kits that are imported from Germany.